It’s not so mysterious, after all. And neither is your coffee or Coke habit. Exploring the subconscious signals we take in every day. If, like me, you’re a chocoholic, you know all too well about those moments when every ounce of your being is overwhelmed by the desire to taste chocolate. At those times, you can think of nothing else. If you’re a smoker, a coffee drinker, or a daily Coke sipper, you’re no doubt familiar with strong cravings that force you to single-mindedly pursue what your body is crying out for. Cravings come at the oddest times in the most peculiar places and I can’t help but wonder what sets it off. I mean, why am I craving this chocolate right now–and not an hour ago? 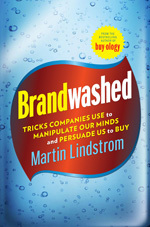 If you’re familiar with my books–Brandwashed or Buyology–you know that I strongly believe our subconscious mind controls almost all of our behavior. Working with the soft drink industry, I’ve come to see that the slightest hint of a carbonated bubble on the can translates into an increase in sales well into the millions. So, it’s hardly surprising that Coke executives can spend hours debating how many bubbles will be displayed in ads, on posters, and on bottles and cans. They are well aware that the correct number of bubbles can inspire the very cravings that work wonders for their profit margins. A similar phenomenon occurs with the curved red roofs that are commonly found at McDonald’s. In fact, those slanted roofs generate 54% more business than more ordinary ones and, astoundingly, this is regardless of whether they’re topped with the golden arches or not. Now, if a few bubbles or a curve in a roof can make such a remarkable difference, there must an almost unquantifiable number of other signals that we’re subconsciously taking in every day. A short while ago, I was heading to the airport with a good friend who has a taste for gambling. I happened to notice a roadside sign that said: “Airport – 36 miles.” Within moments, he was pondering the possibility of finding a casino close to where we were going. Curious, I asked him what prompted this particular musing. He simply replied: “No particular reason.” As I turned this over in my head, I recalled the sign. 36 miles. I then remembered that 36 is his lucky number. Was this merely coincidental? Another case. My mother is a heavy smoker. For decades I tried every trick in the book to persuade her to quit. I left horrifying articles in her bedside drawer. I begged and pleaded. I urged her to try hypnotherapy, nicotine replacement therapy, and even going cold turkey. Nothing succeeded. I had resigned myself to failure. However, with my recent work in the neuroscience field, I decided to change my approach and give it one more go. I somehow managed to persuade her to quit smoking for just one week. I then asked her to rank the experience on an hourly basis using a scale from 0-100 (with 100 being most difficult). The average score showed to be in the high 90s, reflecting what’s unquestionably a tough experience. In the week that followed, I decided to redecorate the family home. (Forgive me–I’m an only child, and we only children tend to be quite demanding.) As I made my way through each room, I purged every little item that had a connection with smoking. I gathered matches and cigarette packs, ashtrays, and lighters. The implements filled two whole boxes. I then asked her to go through the rating-the-craving exercise again. Surprisingly, the ratings were now in the high 80s. Apart from the fact that she was in her second week of not smoking, it reinforced my theory that our subconscious is constantly absorbing signs and signals that play a role in our behavior. By systematically beginning to be conscious of each time my chocolate cravings begin, I then began to backtrack to see whether I could identify something that had triggered the desire. The results were quite revealing. It could be anything from a Toblerone resting on top of my hotel room’s mini bar to an ordinary carpet decorated in brightly colored dots. These blue, red, green, and yellow circles were all that my mind needed to wander into an M&M reverie. The most disconcerting thing about this exercise was that I had been unconscious of the effect these symbolic images have on us, whether they are intentional (as in the case of advertisers) or not. But if the shape of a roof, a bubble on a soft-drink can, or a carpet’s colorful circular pattern can make us crave a burger, a soda, or a chocolate, do we become more susceptible to these subconscious signals when we’re hungry? It is a question that Rémi Radel of the University of Nice Sophia-Antipolis in France recently decided to tackle. Using 42 students with a normal body mass index, he instructed them to not to eat for four hours before arriving at the lab. Some were told there was a delay and they were to go get lunch before returning. Some were asked to wait 10 minutes. In other words, half were hungry when they took the test, while the other half were not. The test involved looking at a computer screen where 80 words were individually flashed on the screen at the rate of one per 300th of a second–too brief to be read. About a quarter of the words were food related, and the participants were asked to rate how bright they were. Hungry people reported food-related words as brighter. In fact, they were far better at picking them. Last week, the results were published in the APS journal Psychological Science. Rémi Radel was able to conclude that hungry people saw the food-related words as brighter and were better at identifying food-related words. He said that that our brain is at the “disposal of our motives and needs.” According to him, “There is something inside us that selects information in the world to make life easier.” The subconscious is obviously ever-vigilant. So, next time you feel a craving coming on, take time out to examine where you’ve just been and what you’ve just seen. The chances are that your free-floating thoughts are not quite so free. Or we could just dispense with all the theorizing and bring on the chocolate! That’s one thing that makes me happy. As you’ve just seen, you haven’t learned a thing. You’ve just fallen for the ninth most successful spam subject line. translated into 30 languages. More at martinlindstrom.com.